1. Is Saidel's a bakery? 4. Where do you deliver to? 5. What time do you deliver? 6. Are your products expensive? 7. Is there a minimum order? 9. What is the latest I can order? 11. Where are you located? those listed on your website? 17. Where can I hear Les Saidel speak? 18. Do you make anything gluten-free? No. We are much more than that. Saidel's Artisan Baking Institute is the foremost authority on artisan baking in Israel, specializing in authentic Jewish breads. We provide training in all aspects of artisan baking and health. We consult, provide guidelines and train organizations, institutions and businesses who are developing an artisan baking process or artisan baked products. We design and develop innovative, exclusive, new products for our clients, restaurants, hotels, bakeries and institutions. We educate by means of a wide range of workshops, courses and lectures, targeted at every age and level. Finally, Saidel's offers a "personal chef" service where we personally bake you something healthy and delicious. 2. How can I sample and buy your products? Saidel's is not like any regular bakery. We do not mass produce baked goods and sell them over the counter in any store. Instead, we have opted for the model of the "personal chef". You, the customer, commission us to be your personal chef/baker and to prepare for you a variety of special items we are expert and exclusive in. This includes many exclusive items that we invented and developed ourselves and also a number of well-known traditional/ethnic items that are not available elsewhere In Israel You may find the menu of these items on our website at www.saidels.com/order.htm Simply call us toll free (1-800-35-1222) or use our online form to commission us to prepare any number or quantity of the items on the list and we will personally prepare and deliver them fresh to your door, every Friday or erev chag. It is exactly the same as having a personal chef preparing the item in your own kitchen. Nothing is better than home prepared food and this is exactly that. The items are prepared by your personal chef/baker according to your personal preferences, with the same tender loving care, freshness and health as if you prepared them yourself in your own kitchen for your family. 3. Why do you not have stores that sell your products? Being a regular bakery and/or or selling our products through stores requires a compromise. You have to compromise on the freshness and on the health benefits of the product. Selling from a store requires prolonging the shelf life of the product and this can only be done using various chemicals and preservatives. Saidel's Artisan Baking Institute believes that this compromise comes at too high a cost. We believe that food products should be fresh, straight out of the oven, directly to your table, made from only healthy, organic, nutritious ingredients. Using our "personal chef" model we achieve exactly that. The items are prepared by order only in the morning and delivered to your door a few hours later. They are as fresh as fresh can be and therefore preservatives, additives or chemicals are unnecessary. This is the way food should be, fresh and healthy. Modiin, Buchman: Aronowitz Family, Rechov Leah Imenu 16/5, 2nd floor, Buchman, Tel 054-6627407. Modiin, Dimri: Epstein Family, Rechov Yigal Yadin 39/21, Dimri (3rd Building down from Bar Lev, 6th Floor), Tel 08-9716192. Ramat Bet Shemesh: Abrams Family, Nachal Habesor 10/4, cnr. Nachal Refaim, tel: 02-992-3334. Raanana, Ravutzky: Taback Family, Ravutsky 11 gimmel, tel: 09-7413019. Raanana, Yehuda Halevi: Ginsberg Family, 31a Yehuda Halevi St., tel: 052-5850057. Delivery times depend on the season and workload in any specific week. During winter months delivery times are earlier than in summer months. On days where we have large order volumes, like before chagim, the amount of deliveries is larger and you may receive your delivery later than normal. All deliveries will be delivered in time for shabat/chag (and in time so the driver may return home before shabat/chag). Please read your email order confirmation to see what time we will be delivering. When people think boutique bakery, personal chef, they think astronomical prices. We believe that healthy baked goods should also be affordable and ours are. For example you may simply commission us to make you 1 lonely bagel if you so wish, for only 5.5NIS. While our products are certainly more expensive than regular supermarket bread, they are also in a much higher class, both in quality and in health. Many people fool themselves into thinking that they are getting healthy bread, simply because it says "whole wheat" on the label. The market is flooded with scams and blatant misdirection, making you think what you are buying is really healthy when it is not. Our products are the real thing, with no compromises. If you are picking up your order from one of our pickup points, there is no minimum order. If you are ordering a home delivery there IS a minimum order - 30 NIS (excluding the 10NIS delivery fee). 8. I ordered online. How do I know you received my order? After you click the submit button on our order form, you order is processed automatically by our system and you will receive an email confirmation to the email address specified in the form. If you do not receive email confirmation then there has been a glitch and your order was not recorded correctly by our system. Please wait 10 minutes. If by then you have not received email confirmation of your order (also check your Spam mailbox), call us at 1-800-35-1222 and clarify if we received your order or not. We usually shut online ordering down around 6:00pm on Thursday night (the night before delivery). Remember, after we receive your order we still have to bake the items and there are only 12 hours in a night. If it is later than 6:00pm try calling us at 1-800-35-1222 to see if we can still accept your order telephonically. 10. There are items on your order page in red that I cannot specify an amount for. Why? Items in red on our order form are not in stock that week and cannot be ordered, or you have ordered late and we are past our production limit on that item and had to shut down ordering for it for that week. It is advisable to order as early as possible to ensure you get the items you want. Our institute is located in Karnei Shomron, about 15 minutes drive from Kfar Sava, or the Chorshim exit on Route 6. Our address (for WAZE) is HeHadas 22, Karnei Shomron. 12. Do I have to come to you to do a course or workshop? We conduct courses and workshops here at our institute, but we also do them at any location that you require. We routinely do workshops at peoples' homes, at companies, halls, etc. We even once did a workshop on the deck of the Lido boat in the middle of the Kinneret. 13. What is the difference between a workshop and a course? A workshop is one session, duration 3 hours. A course is 4 sessions, 3 hours each, once a week for 4 weeks. 14. Can I do a different workshop than those listed on your website? We are experts in tailor making a workshop to your own requirements, like combining elements of different workshops into one, altering the time frame, structuring the workshop around your event schedule, like a bat mitzvah party, for example. Please call for information about upcoming scheduled workshops and courses and to discuss how we can tailor make a workshop just for you. 15. Is there a minimum number of people required for a workshop? It is not financially viable for us to do a workshop for less than a minimum amount of people in a group. This varies depending on the type of workshop. Call or email us for more details. 16. Is there different pricing for adult and kids/family workshops? Yes. Kids/Family workshops cost less than adult workshops. Call toll free in Israel - 1-800-35-1222, or internationally - 972-9-7941222 for our latest price list. Master artisan baker and CEO of the Saidel Artisan Baking Institute, Les Saidel, is a popular speaker on the lecture circuit and a guest speaker at many community and public events. You may book him for your own event or gathering by calling 1-800-35-1222. You may also read Les' monthly column in the Jerusalem Post "In-Jerusalem" and "Metro" supplements, published on Fridays. Click here for a list of articles publsihed. In order to obtain gluten free certification you need a separate facility that manufactures only gluten free items. We do not have a separate facilities - all our products are made in our one facility. We do make a number of items that have very low gluten, like oats flour products, but it is not a 100% gluten free environment. If you are celiac, our products are not suitable for you. If you are simply gluten intolerant they are. 19. What is the allergen info on your products? Each product on our order page has full ingredient info. In general, all our products contain gluten or traces of gluten. Many of our products contain sesame seeds. Some contain hazelnuts and walnuts. There are therefore traces of sesame, walnuts and hazelnuts in our bakery. If you are allergic to any of these we recommend that you do not use our products. 20. If you are a healthy bakery why do you use margarine in some of your products? 21. 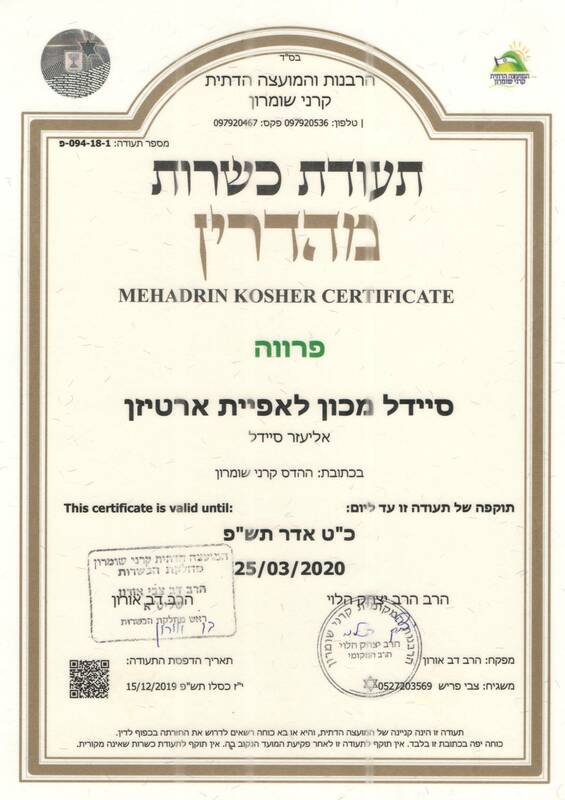 What hechsher (kosher certification) do you have?